Lieselotte Heederik will use the $75,000 she won in the health category of the Silicon Valley Tech Awards last week to help 150 to 250 million Indonesians in need of clean water. In Indonesia, most people either buy water at local water kiosks or boil it to kill the bugs. The water kiosks, however, are poorly regulated. Oversight is lacking to make sure filters are cleaned and UV lights are changed regularly. The ministry of health recommends boiling bought water all the same. Boiling water requires energy and thus incurs a cost, making it difficult for those lacking means. The Center for Disease Control and Prevention advises people to drink bottled water that has been sealed. Many of the more than 8 million tourists who visit the country annually might mistakenly think all water from the water kiosks is safe. Here is where the Nazava filter comes in. The simple system is nine times cheaper than buying water, and four times cheaper than boiling. Ceramic pores filter out dust, particles, bacteria, and parasites. Activated carbon reduces harmful organic components, such as pesticides and chlorine. A silver lining kills organisms smaller than half a micron that have made it through the ceramic pores. The filter comes in all shapes and sizes, with the most affordable transparent water filter series able to hold 27.5 liters (7.2 gallons). The system can be used overnight and provides enough drinking and cooking water to use for a day. It can also be installed on the water faucet, providing a house with safe water right from the tap. 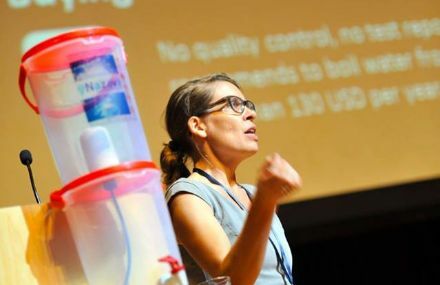 Heederik built the first filter out of local materials for her personal use while she was in Indonesia working for nongovernmental organizations. She saw the potential for lasting change in the region. The disaster relief programs she was helping with depended on donations and she was tired of how much effort went into justifying how the money was spent. A staff of six now works to provide Indonesians with Nazava filters; the filters are also exported to Pakistan, Mozambique, and Ghana. Nazava has sold more than 75,000 filters thus far. The prize money from the Silicon Valley Tech Awards will help make the filters available for more people and boost Nazava’s marketing through mobile phones. The company will translate information about the filter into more local languages and develop its safe water app. “Americans believe in our approach—business instead of charity; selling instead of donating; developing products poor people can use,” Heederik said. The awards are about more than a gala and prize money. Social entrepreneurs benefit from an “ecosystem in which impact-investors, incubators, hubs, universities, and designers support each other to counteract global poverty,” Heederik said. Heederik was happily surprised by the Global Social Benefit Incubator, which helps social entrepreneurs build sustainable business models. Coaches from Apple and Scandisk helped 20 impact-investors extensively by going over a business-plan presentation, and discussing social marketing, impact monitoring, and other related topics. The investors also had a two-minute speed-pitching session. Heederik experienced a bit of a shock going from her usual mode of transportation—a scooter or mountain bike—to riding in a limo, and going from a $10 backpacker’s hostel to a $280-a-night Silicon Valley hotel. At the black-tie gala in Santa Clara, Calif., Nov. 14., four others were also awarded $75,000 prizes in the categories of environment, education, young developers, and economic development. The other five laureates won $25,000.